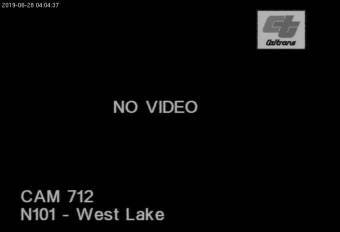 US-101 North At Westlake Blvd - A view of the current traffic situation. Canoga Park, California: Canoga Park High School, 12.9 mi. Topanga Beach, California: Live Surf Camera, 16.3 mi. Porter Ranch, California: Weathercam, 18.9 mi. Santa Monica, California: Santa Monica Beach, 21.5 mi. Oxnard, California: Oxnard School District, 22.5 mi. Valencia, California: College of the Canyons, 22.6 mi. Venice Beach, California: HD Stream Muscle Beach, 23.5 mi. Marina del Rey, California: Marina Aquatic Center, 24.8 mi. This webcam Thousand Oaks, California with the theme Traffic was added on July 19, 2012 and is operated by California Department of Transportation (Caltrans). It got 981 visitors since then. Shouldn't this webcam work or should the link be wrong please report that here. You can add this webcam here to myCams.